Astronomical observatories were built and designed to map celestial events throughout the year. Ancient man discovered that celestial events follow cycles and needed a way to track them. Approximately 5,000 years ago early man devised a way to place stones in a certain positions to align for events like the seasons, lunar phases, solar phases and so on. As mankind has always been fascinated by the heavens, their mythologies reflecting many of these monuments connected to the Gods and Goddesses their civilization worshipped. In examining the observations of such peoples, it is possible to gain a certain insight into the ways in which they constructed their own universes and therefore provide a more holistic understanding of the means and motivations of the culture as a whole. The astronomical inquiry of the ancients must be looked upon as a mechanism of observation and prediction which closely tied them to their environments, depending upon their cultural, religious and mythological bases for validation in the process. The erection of these monuments was a great task created by the astronomers, priests, and stone builders of each culture. This was a global phenomenon. These ancient people are presently referred to as the Megalithic Stone Builders erecting huge edifices around the planet, many of which were placed on sacred grid points, indwells and outwells of powerful energy. The remnants of their achievements can be found throughout the planet especially where the power grids intersect. The ancient Megalithic Stone Builders used this knowledge to better calculate when the Earth energies would be at their peak. If the energy-ley lines that run down the major axis of their observatory or power site is oriented to the Summer Solstice Sunrise, then that would be the day that particular site will experience a peak of power. 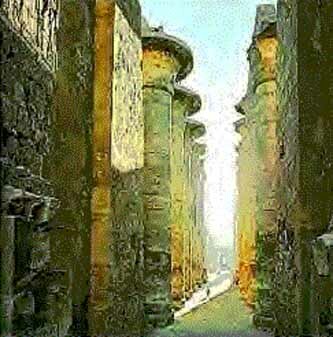 They used this opportunity to visit these places which became temples for meditation, a place to talk to their Gods, or to move through 'interdimensional doorways'. 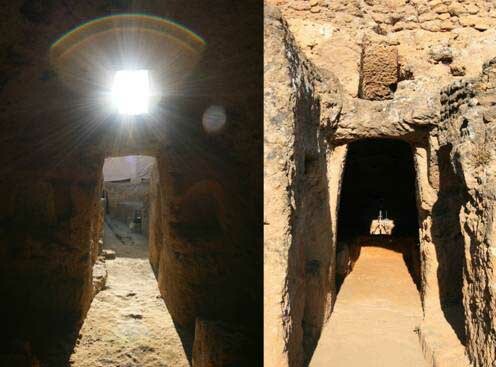 Some astronomical sleuthing has revealed the cultic past life of a Roman tomb in Spain. 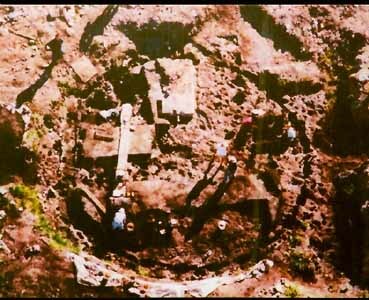 Researchers believe the burial site was once used as a Mithraic temple, positioned to line up with the constellations and guide sun through its window during the equinoxes. The Carmona necropolis in Seville is full of burials from the 1st century B.C. through the 2nd century A.D., including the so-called Elephant's Tomb, named so for an elephant-shaped statue discovered inside the structure. Researchers have debated what this structure was used for and archaeologists from the University of Pablo de Olavide in Seville now propose that it served as a place of worship for devotees of Mithraism, a cult that thrived during the Roman Empire. Once a year, at the winter solstice, the rising sun shines directly along the long passage into the chamber for about 17 minutes and illuminates the chamber floor. The sun enters the passage through a specially contrived opening, known as a roofbox, directly above the main entrance. Although solar alignments are not uncommon among passage graves, Newgrange is one of few to contain the additional roofbox feature The alignment is such that although the roofbox is above the passage entrance, the light hits the floor of the inner chamber. Today the first light enters about four minutes after sunrise, but calculations based on the precession of the Earth show that 5000 years ago first light would have entered exactly at sunrise. The solar alignment at Newgrange is very precise compared to similar phenomena at other passage graves such as Dowth or Maes Howe in the Orkney islands, off the coast of Scotland. Current-day visitors to Newgrange are treated to a re-enactment of this event through the use of electric lights situated within the tomb. 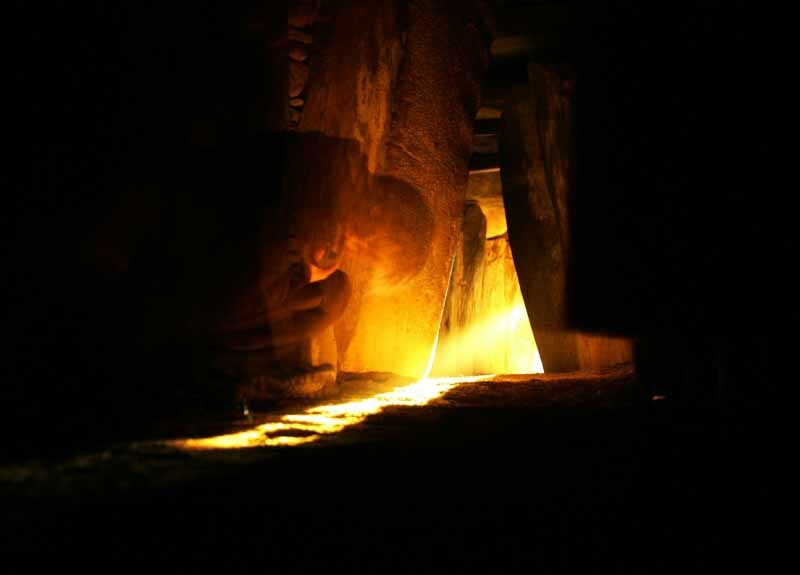 The finale of a Newgrange tour results in every tour member standing inside the tomb where the tour guide then turns off the lights, and lights the light bulb simulating the sun as it would appear on the winter solstice. Anyone visiting the historic site can experience an approximation of the phenomenon any time of year, and is often the highlight of the tour. A lottery is held annually for "tickets" to be allowed into the tomb to view the actual event. The popularity of this event was the reason a lottery was introduced, and also why the lights were installed. At dawn on Winter Solstice every year, just after 9:00 am, the sun begins to rise across the Boyne Valley from Newgrange over a hill known locally as Red Mountain. Given the right weather conditions, the event is spectacular. At four and a half minutes past nine, the light from the rising sun strikes the front of Newgrange, and enters into the passage through the roofbox which was specially designed to capture the rays of the sun. For the following fourteen minutes, the beam of light stretches into the passage of Newgrange and on into the central chamber, where, in Neolithic times, it illuminated the rear stone of the central recess of the chamber. With simple stone technology, these wonderful people captured a very significant astronomical and calendrical moment in the most spectacular way. Newgrange appears to have been used as a tomb. The recesses in the cruciform chamber hold large stone basins into which were placed cremated human remains. During excavation, the remains of five individuals were found. It is speculated that the sun formed an important part of the religious beliefs of the neolithic ("New" Stone Age) people who built it. Formerly the mound was encircled by an outer ring of immense standing stones, of which there are twelve of a possible thirty-seven remaining. However, it seems that the stone circle which encircled Newgrange is not contemporary with the monument itself but was placed there some 1,000 years later in the Bronze Age. According to Irish mythology, Newgrange was one of the sidhe, or fairy-mounds, where the Tuatha De Danann lived. It was built by the god Dagda, but his son Oengus later tricked him out of it. It is named for the goddess Boann, the mother of Aengus, who is also credited with the creation of the River Boyne. According to some versions of the story, the hero Cuchulainn was conceived there. However, most of the mythical cycles associated with Newgrange date from the Celtic era of Irish history and mythology. The monument was already in existence for well over 2,000 years before the Celtic era. A huge early Celtic calendar construction has been discovered in the royal tomb of Magdalenenberg, nearby Villingen-Schwenningen in Germany's Black Forest. This discovery was made by researchers at the Romisch-Germanisches Zentralmuseum at Mainz in Germany when they evaluated old excavation plans. The order of the burials around the central royal tomb fits exactly with the sky constellations of the Northern hemisphere. Whereas Stonehenge was orientated towards the sun, the more then 100 meter width burial mound of Magdalenenberg was focused towards the moon. The builders positioned long rows of wooden posts in the burial mound to be able to focus on the Lunar Standstills. These Lunar Standstills happen every 18,6 year and were the 'corner stones' of the Celtic calendar. The position of the burials at Magdeleneberg represents a constellation pattern which can be seen between Midwinter and Midsummer. With the help of special computer programs, Dr. Allard Mees, researcher at the Romisch-Germanischen Zentralmuseum, could reconstruct the position of the sky constellations in the early Celtic period and following from that those which were visible at Midsummer. This archaeo-astronomic research resulted in a date of Midsummer 618 BC, which makes it the earliest and most complete example of a Celtic calendar focused on the moon. the sunrise of winter solstice. It has been long recognized that the ancient Egyptians possessed a great knowledge of geometry, mathematics and astronomy , all being the basis for the Great Pyramid of Giza which for 5000 years has stood as a monument to the great cultures that once populated the Nile River Valley. One of the greatest achievements of the Egyptians is the creation of a calendrical system which relied heavily on lunar observations. By 3000 B.C., they had devised a solar calendar of 365 days, the starting point of which hinged on the helical rising of Sirius, which also happened to coincide with the time of the summer solstice and the annual flooding of the Nile. While this all may seem to be rather unimpressive it serves to solidify the intrinsic necessity for ancients to be in touch with natural surroundings, through tracking celestial phenomenon, the Ancient Egyptians were able to predict events of great significance in their desert environment.There are other celestial observatories like it in Egypt. Researchers have found a complex of slabs and stones in the Sahara Desert that might be the oldest known monument built with astronomical considerations in mind - far older than England's Stonehenge. It was constructed by nomadic cattle-herders as much as 7,000 years ago in southern Egypt, and probably was intended for rituals rather than astronomical observations. 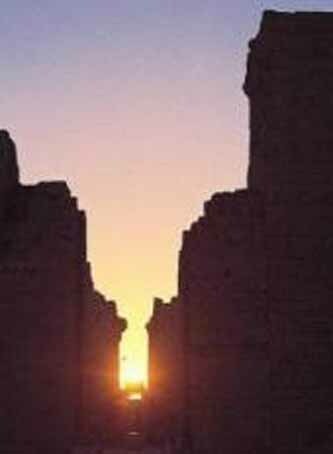 An expert in ancient astronomy said that it would be among the oldest astronomical monuments known, but that the ages of such monuments are so uncertain it's impossible to know if the Egyptian complex is the oldest. He also said the study presents suggestive evidence, but not proof, for astronomical design. The monument was discovered over several years of field work ending in 1997. Stonehenge was first used about 5,000 years ago and gained some of its current stones about 4,000 years ago. The stones indicate the points of midsummer sunrise and midwinter sunset, but nobody knows just what people used Stonehenge for. The Egyptian stone complex, which isn't circular like Stonehenge, is spread over an area 1.8 miles by three-quarters of a mile. It includes 10 slabs some 9 feet high, 30 rock-lined ovals, nine burial sites for cows, each under a pile of 40 to 50 rocks weighing up to 200 or 300 pounds apiece, and a "calendar circle" of stones. Many of these features line up in five radiating lines, one of them running east-west. The calendar circle is a 12-foot-wide arrangement of slabs about 18 inches long, most of them lying down. 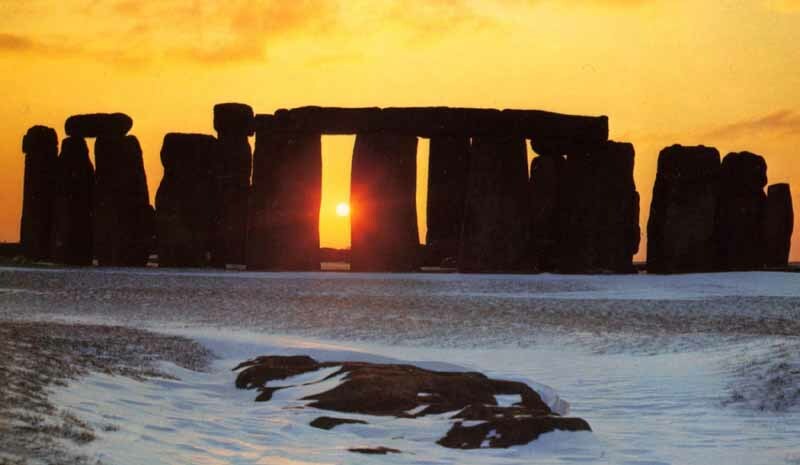 Two pairs of upright stones stand directly across the circle from each other, defining a view that would have displayed sunrise at the summer solstice, the researchers said. That would be an important day to the cattle-herders, because summer is when monsoon rains would begin. But the circle wouldn't have been a very accurate indicator of when the solstice was occurring. It was "more symbolic than practical. The circle also contains two other pairs of standing stones that defined a north-south view. Charcoal from hearths around the circle and wood from one of the burial sites date to about 7,000 years ago. It's not clear when most of the rest of the monument was erected, but it was at least 5,000 years ago. 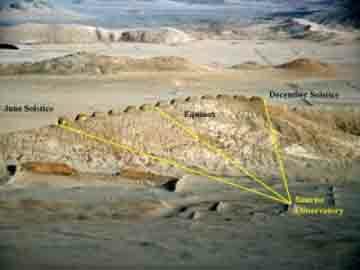 An ancient astronomical alignment in southern Peru has been discovered by researchers between a pyramid, two stone lines and the setting sun during the winter solstice. During the solstice, hundreds of years ago, the three would have lined up to frame the pyramid in light. The two stone lines, called geoglyphs, are located about 1.2 miles (2 kilometers) east-southeast from the pyramid. They run for about 1,640 feet (500 meters), and researchers say the lines were "positioned in such a way as to frame the pyramid as one descended down the valley from the highlands." 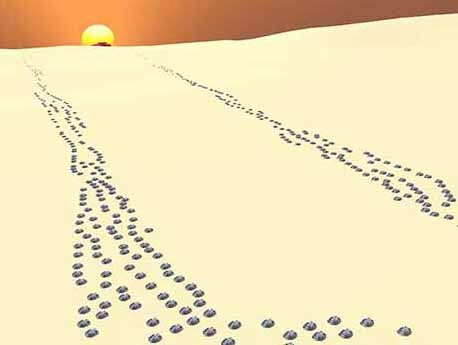 The oldest solar observatory in the Americas has been found, suggesting the existence of early, sophisticated Sun cults, scientists report. It comprises a group of 2,300-year-old structures, known as the Thirteen Towers, which are found in the Chankillo archaeological site, Peru. The towers span the annual rising and setting arcs of the Sun, providing a solar calendar to mark special dates. A mysterious set of monuments in Peru make up the oldest solar observatory in the Americas, according to a new study. The 2,300-year-old Thirteen Towers of Chankillo were used for marking the sun's position throughout the year - an activity that was part of the sun-worshipping culture of the Inca, the study authors said. The large stone towers are arranged in a line along a ridge near Chankillo, a walled hilltop ruin north of Lima. "This is the oldest known example of landscape timekeeping in the Americas," said Ivan Ghezzi, lead author of the study and an archaeologist at the Pontifical Catholic University of Peru. 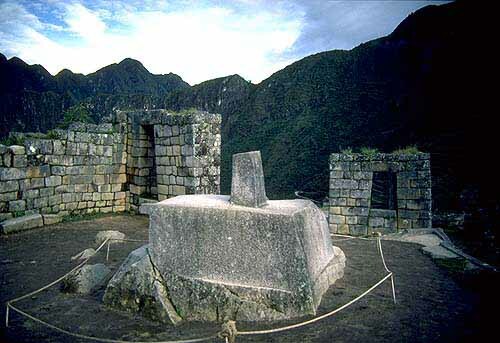 One of Machu Picchu's primary functions was that of astronomical observatory. The Intihuatana stone (meaning 'Hitching Post of the Sun') has been shown to be a precise indicator of the date of the two equinoxes and other significant celestial periods. The Intihuatana (also called the Saywa or Sukhanka stone) is designed to hitch the sun at the two equinoxes, not at the solstice (as is stated in some tourist literature and new-age books). At midday on March 21st and September 21st, the sun stands almost directly above the pillar, creating no shadow at all. At this precise moment the sun "sits with all his might upon the pillar" and is for a moment "tied" to the rock. At these periods, the Incas held ceremonies at the stone in which they 'tied the sun' to halt its northward movement in the sky. There is also an Intihuatana alignment with the December solstice (the summer solstice of the southern hemisphere), when at sunset the sun sinks behind Pumasillo (the Puma's claw), the most sacred mountain of the western Vilcabamba range, but the shrine itself is primarily equinoctial. Shamanic legends say that when sensitive persons touch their foreheads to the stone, the Intihuatana opens one's vision to the spirit world (the author had such an experience, which is described in detail in Chapter one of Places of Peace and Power, on the web site, www.sacredsites.com). Intihuatana stones were the supremely sacred objects of the Inca people and were systematically searched for and destroyed by the Spaniards. When the Intihuatana stone was broken at an Inca shrine, the Inca believed that the deities of the place died or departed. The Spaniards never found Machu Picchu, even though they suspected its existence, thus the Intihuatana stone and its resident spirits remain in their original position. The mountain top sanctuary fell into disuse and was abandoned some forty years after the Spanish took Cuzco in 1533. Supply lines linking the many Inca social centers were disrupted and the great empire came to an end. The photograph shows the ruins of Machu Picchu in the foreground with the sacred peak of Wayna Picchu towering behind. Partway down the northern side of Wayna Picchu is the so-called Temple of the Moon inside a cavern. As with the ruins of Machu Picchu, there is no archaeological or iconographical evidence to substantiate the new-age assumption that this cave was a goddess site. As with other ancient cultures, observatories, pyramids and temples were erected based on celestial alignments. Prior to the Maya rising to power circa 400 AD in Central America and Mexico, there is evidence that the Olmec people had already begun to use astronomical orientations to direct the layout of several ceremonial centers, with the Pyramids of the New World oriented to observing and predicting the motions of the Sun and Mon. As with the Egyptians, we can deduce that Mayan astronomical endeavors, heavily relied upon the ritual and ceremonial worlds of the culture, however, here we have a wealth of evidence to substantiate such claims. Left behind are codices, or systems of hieroglyphic recordings of the Maya, and which include celestial sightings and how these sightings and predictions are woven into the entire cultural complex. In Chichen Itza, in Mexico there is a celestial observatory to the stars that was aligned along the line of the summer solstice and the winter soltice. It was built by the ancient Maya and their God Quetzalcoatl. 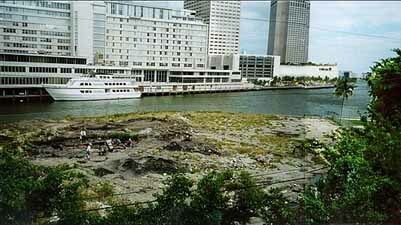 The Miami Circle, also known as The Miami River Circle or Brickell Point, is an archaeological site in downtown Miami, Florida. It consists of a perfect circle of 24 holes or basins cut into the limestone bedrock, on a coastal spit of land, surrounded by a large number of other 'minor' holes. It is the only known evidence of a permanent structure cut into the bedrock in the United States, and considerably predates other known permanent settlements on the East Coast. It is believed to have been the location of a structure, built by the Tequesta (also Tekesta) Indians, in what was possibly their capital. It was discovered in 1998, and is believed to be somewhere between 1700 and 2000 years old, though some have questioned both its age and its authenticity. A strange circle formation has been discovered at the mouth of the Miami River in what could be signs of an ancient culture. Archeologists have discovered a perfect circle measuring 38 feet in diameter, with 24 irregular cut basins, ranging in size from one to three feet. Some experts believe the basins depict the images of sea turtles, dolphins, sharks, manatees, shrimp and other marine animals. Centuries or millennia after its creation, the formation still seems sacred because of its apparent function as a temple or astronomical device. The structure has 41 potholes on each side of the circle's center along the east-west axis. It measures the precise outlines of the autumnal equinox (the time when the sun crosses the equator, making night and day equal in duration) and the summer and winter solstices (the northern and southern extremes of the sun's seasonal travel through the sky). Could it be that the time-obsessed Maya or maybe a much older culture carved this astronomical observatory for future memory or to remind us what was sacred to our ancient people? Archeologists say the perfect circle measuring 37.5 feet in diameter, with 24 irregular cut basins, ranging in size from one to three feet, may have an "astronomical purpose" as it has an obvious east-west alignment. Some experts believe the basins depict the images of sea turtles, dolphins, sharks, manatees, shrimp and other marine animals. Mainstream experts familiar with the Miami Circle say it may be an astronomical observatory. But they also note it could have been the foundation of a sacred temple with no connection to the stars. Also, mainstream archaeologists do not share the notion of an ancient global stone civilization linking the Egyptians, Incas or Mayans. In addition, the standard view of ancient Egyptian history is that the pyramids were royal tombs - not astronomical monuments. Does this observatory resemble Avebury? The Native Americans called it Star Knowledge which included the ability to mark events based on celestial alignments. Almost everything the Lakota scholars brought together from elders in the Lakota Star Knowledge book is about observations leading to the summer solstice where the sunpath will be at its farthest north, the days are longest, and the Sun Dance is held "when the sun is strongest and the power of growing things is greatest". Cahokia was the most important center for the peoples known today as Mississippians. Their settlements ranged across what is now the Midwest, Eastern, and Southeastern United States. Cahokia maintained trade links with communities as far away as the Great Lakes to the north and the Gulf Coast to the south. Pottery and stone tools in the Cahokian style were found at the Silvernale site near Red Wing, Minnesota. At the high point of its development, Cahokia was the largest urban center north of the great Mesoamerican cities in Mexico. Although it was home to only about 1,000 people before ca. 1050, its population grew explosively after that date. Archaeologists estimate the city's population at between 8,000 and 40,000 at its peak, with more people living in outlying farming villages that supplied the main urban center. If the highest population estimates are correct, Cahokia was larger than any subsequent city in the United States until about 1800, when Philadelphia's population grew beyond 40,000. Fajata Butte in Chaco Canyon, New Mexico boasts a chamber in which a spiral petroglyph may be found. The glyph is surrounded by stone slabs allowing only scant light to penetrate into the darkness, and as the sun makes its appearance, a slit of light climbs the wall arriving at the center of the petroglyph at noon at the time of equinox. A number of artistic depictions of celestial phenomenon can be found as well, left behind by various tribes, indicating that even if they were not predicting the movements of the stare, they were intently contemplating the evident motions of the celestial bodies which corresponded to their various mythologies. This also marks a 19-year lunar cycle as the spiral has 19 rings. Chaco Canyon was an important Anasazi cultural center from about 900 through 1130 AD. About 30 ancient masonry buildings, containing hundreds of rooms each, attest to Chaco's importance. Some structures are thought to serve as astronomical observatories or calendars. At noon on the summer solstice, a dagger of sun penetrates the center of the spiral. On the autumnal equinox, a sun dagger passes through the center of a small spiral on the left, and another passes on the edge of the large spiral. At the Winter Solstice, a big sun dagger passes on either side of the large spiral. Cahokia Mounds in southern Illinois near East St. Louis has a circle of postholes interpreted in 1970 as an astronomical indicator of summer solstice sunrise, winter solstice sunrise, and equinox sunrise. Monk's Mound is the central focus of this great ceremonial center. A massive structure with four terraces, it is the largest man-made earthen mound in North America. Facing south, it is 92 feet (28 m) high, 951 feet (290 m) long and 836 feet (255 m) wide. The Travel Channel has called it the "world's largest pyramid." Excavation on the top of Monk's Mound has revealed evidence of a large building - perhaps a temple or the residence of the paramount chief - that could be seen throughout the city. This building was about 105 feet (32 m) long and 48 feet (15 m) wide, and could have been as much as 50 feet (15 m) high. The east and northwest sides of Monk's Mound were twice excavated in August 2007 during an attempt to avoid erosion. "Woodhenge," a circle of posts used to make astronomical sightings, stood to the west of Monk's Mound. The name is taken from Stonehenge, as this structure marked solstices, equinoxes and other astronomical cycles. Archaeologists discovered Woodhenge during excavation of the site. They found that the structure was rebuilt several times during the urban center's roughly 300-year history. According to Chappell, "A beaker found in a pit near the winter solstice post bore a circle and cross symbol that for many Native Americans symbolizes the Earth and the four cardinal directions. Radiating lines probably symbolized the sun, as they have in countless other civilizations." It is not to be confused with another site of the same name that exists in the United Kingdom. The first circle, only partially excavated, (date unknown) would have consisted of 24 posts: the second circle had 36 posts; the third circle (A.D. 1000), The most completely excavated, had 48 posts; the fourth, partially excavated, would have had 60 posts. 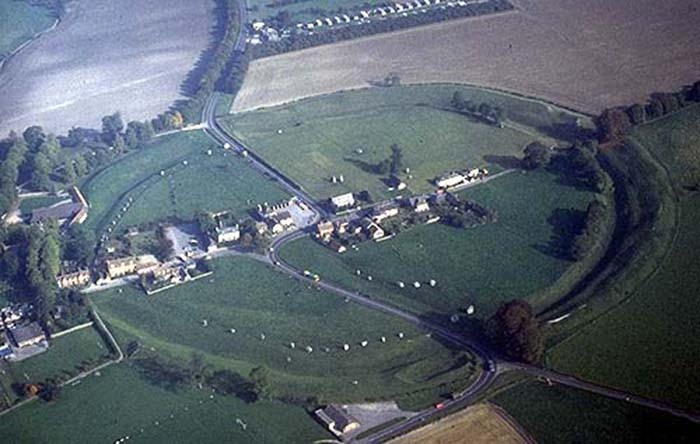 The last Woodhenge was only 12, or possible 13 posts, along the eastern sunrise arc(if it had been a complete circle, it would have had 72 posts). Building only the sunrise arc might indicate that red cedar trees had become scarce. It is not known why the size and location of the circles, and the number of posts was constantly changed - perhaps to include more festival dates or to improve and increase alignments. Only three posts are crucial as seasonal markers - those marking the first days of winter and summer (the solstices), and the one halfway between marking the first days of spring and fall (the equinoxes). Viewing was from the center of the circle, and several circles had large "observation posts" at that location, where it is likely the sunpriest stood on a raised platform. Other posts between the solstice posts probably marked special festival dates related to the agricultural cycle. The remaining posts around the circle have no known function, other than symbolically forming a circle and forming an enclosure to hold the sacred Woodhenge ceremonies. There have been suggestions some posts had alignments with certain bright stars or the moon, or were used in predicting eclipses, and others have suggested Woodhenge was used as an engineering "aligner" to determine mound placements, but none of this has been proven convincingly. The most spectacular sunrise occurs at the equinoxes, when the sun rises due east. The post marking these sunrises aligns with the front of Monks Mound, where the leader resided, and it looks as though Monks Mound gives birth the sun. A possible offertory pit near the winter solstice post suggests a fire was burned to warm the sun and encourage it to return northward for another annual cycle and rebirth of the earth. This probably marked the start of the new year. The third circle (A.D. 1000) was reconstructed in 1985 at the original location. The circle is 410 feet in diameter, had 48 posts spaced 26.8 feet apart (9 are missing on the west side, removed by a highway borrow pit). The posts were 15-20 inches in diameter and stood about 20 feet high. Red ocher pigment found in some of the post pits suggests the posts may have been painted. The post pits averaged 7 feet long and just over two feet wide, sloping from the surface at one end to a depth of four feet at the other, forming a ramp to slide the posts down to facilitate their raising. The Big Horn Medicine Wheel in the Big Horn Mountains near Sheriden, Wyoming was interpreted in 1974 as an indicator of summer solstice sunrise and sunset, with other alignments for the rising of certain stars (Aldebaran, Rigel, and Sirius). Built about 1050 AD. Has 28 spokes, and is about 90 ft in diameter. About 50 similar circles exist. The oldest is in Canada (built about 2500 BC - the age of the Egyptian pyramids, for comparison). The alignments presented by these stone circles are controversial; they could be due to chance. There is no evidence that they were astronomical in design. Why were they interested in those 3 particular stars? Research regarding North American Indian astronomical insight has just recently begun to gain headway in the studies of archeoastronomers, and while the same volume of evidence does not exist as with cultures such as the Maya, the depth of Native American astronomical use and understanding is beginning to emerge. Based on the climactic conditions of more northern latitudes, it is safe to assume that one of the major reasons various tribes tracked the stars was for the prediction of seasonal change, which would indicate to nomadic or semi nomadic peoples that it was time to relocate for the winter months. This idea can be tied to the alignments found by John Eddy in the remains of the Big Horn Medicine Wheel in Wyoming. At Big Horn, Eddy noticed that by standing at the hub of the wheel one is able to deduce "a coherent alignment scheme" where the points on the outer wheel correspond to the sunrise of summer solstice, as well as the rising of Rigel, Aldebaran, and Sirius, all of which have helical risings at the time of year when the site was climactically suited for occupation. Makeshift structures and artwork in the southern United States argue for the ingenuity of the various architects responsible for constructing them, and as to the important part of astronomical phenomenon in constructing their own cosmos. 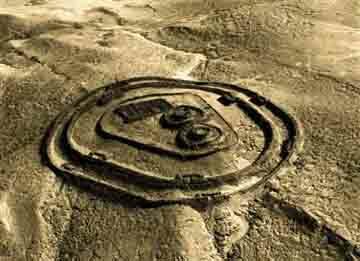 Von Del Chamberlain notes that even structures dedicated to habitation may have served as observatories, and has found that the Pawnee earth lodges "highlight a number of celestial phenomena, ranging from the movement of the solar disk to that of constellations known to have been named". While lack of written records stall progress somewhat, the strong mythological tradition that exists among the descendants of various North American Indian groups helps in deciphering the origins of myth that would lend explanation as to the importance of the sky in the life ways of native cultures. A certain number of scholars however have raised the question as to whether North American Indian astronomy can in fact be considered in the context of archeoastronomy and its study of prehistoric peoples, contending that these Indian populations may have been tainted by Christian schools of thought somewhere along the line. While this is a valid point, and deserves consideration, it is important to account for the mythological elements which factor into the overall schematic.